After the disappointment of last weekend in Dublin, the Irish rugby team heads to Scotland on Saturday afternoon in search of their first win of the campaign, while the excitement of the Premier League title race continues with another round of games. If you manage to grab your sports-mad children away from the television, you'll be rewarded with a mild, dry weekend to enjoy some fun activities around the country. (Or, in my case, plan the weekend around your children's busy schedule). We've listed a few ideas below as well as some early tips for things to do during the upcoming mid-term break. 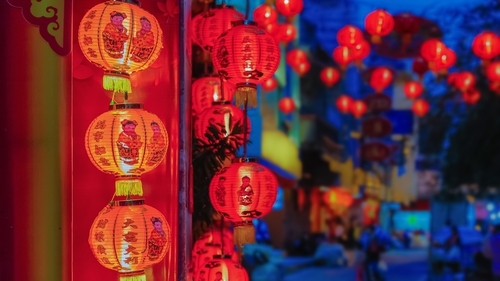 The hugely popular Spring Festival Fair returns to The CHQ Building this weekend with a jam-packed two-day programme of free family-friendly entertainment as part of the Dublin Chinese New Year Festival. Inspired by Chinese temple fairs, or ‘Miaohui’, the event combines performances, workshops, storytelling with Tadhg Mac Dhonnagáin, screenings, demonstrations, games and tasty food stalls. Ireland's Largest Motorcycle Festival takes place in the Eikon Exhibition Centre takes place from 8th - 10th and promises to be a fantastic show with an array of features, personalities, and stands. The family event includes top manufacturers & dealers with a selection of new and classic bikes, stunt shows, aerial displays, Supermoto races and more. Under 16's go free. Join an introductory tour on Sunday 10th from 15:00-16:00 to learn about the history of Collins Barracks from the 1700s to the present day and its transition from Barracks to Museum, taking in some of the highlights from the Museum's military history or decorative arts exhibitions. Admission free but places allocated on a first-come basis 15 minutes before the tour. It all started with YouTube videos and on Friday John D Ruddy brings Manny Man to Letterkenny as they plow through Irish history from the Ice Age all the way to today - in less than 90 minutes! When it comes to fun history, Manny Man is your only man! The Crawford Art Gallery is hosting free tours and workshops with music from midday each Sunday. This week there is a Valentine inspired art workshop with Lynda Loughnan and a tour with Matthew Whyte at 2pm. The DLR Winter of Heritage programme runs until March with free guided tours of Cabinteely House, James Joyce Tower, Marlay House, The Oratory and The Maritime Museum. This Sunday, Bosco’s Garden and Snow White visit the Mullingar Arts Centre as part of Bosco's 40th-anniversary tour. Bosco is Bosco, not a boy, not a girl, just a Bosco: a cheeky, lovely, funny, slightly-cracked, irrepressible, eternal five-year-old who lives in a box and who loves nothing more than to just be Bosco and meet all the boys and girls. This Saturday in the Solstice Arts Centre, Navan, create secret communication systems, discover intriguing concealment techniques and assemble your very own retro spy gadget. Children will explore spy scenarios through physical theatre and leave coded communications for other visitors. The workshop runs in conjunction with their new exhibition Surveillé·e·s, which is on display until 1st March. With fantastic costumes, an amazing stage set and colourful lighting this live performance is a popular, fun-filled musical show featuring Goldilocks, The Three Bears, Ruff the dog and Mr. Bunny. Each Sunday, families are welcomed and encouraged to feel comfortable in the Gallery with a free creative workshop at 11:30 and a family friendly tour at 12:30. Drop-in and stay for as long (or as little!) as you wish. Suitable for children of all ages. Children with have great fun joining in on the action, singing songs, playing games and meeting some amazing characters in the Iontas Theatre, Castleblaney on Sunday. Wrap up warm this weekend, pull on the wellies and have fun with all the family as you get close to amazing wetland wildlife at Castle Espie. Have fun in their indoor and outdoor adventure play areas, enjoy nature’s winter spectacle and mark off your adventure checklist as you explore the stunning protected reserve. John Cleese narrates this update from the Hundred Acre Wood as Winnie and friends return to the big screen on Sunday. Eeyore's lost his tail, Winnie is still craving 'hunny' and everyone is hiding from the mysterious Backson. With over 180 events across over 50 venues, the NI Science Festival offers a stimulating and wide range of events focusing on the wonders of science, technology, engineering, and mathematics. Part of Fantastic Flix at The Ark next weekend, you can find out more about composing for film, as children aged 5-7 join musician and performer Morgan Cooke who will guide them through this fun class for young musicians. At the end of the workshop there will be a live performance for friends and family. Make this Valentines Special with an officially fictitious marriage certificate from Father Ted at the Wax Museum, and if you're feeling very romantic you can try out their horror section - not for the faint-hearted! YourDaysOut is a sales and marketing platform for local businesses and event organisers with tools to help promote, publish and sell tickets and bookings online, for up to 50% less that other ticket sites. It is also No.1 in Ireland for people looking for things to do, where users can FOLLOW their favourite pages, get notifications about any offers, events and buy hotel deals in Ireland.